I love the way @langwitches explains this to the children, even though the back channel is as much real life for me as the front conversation! 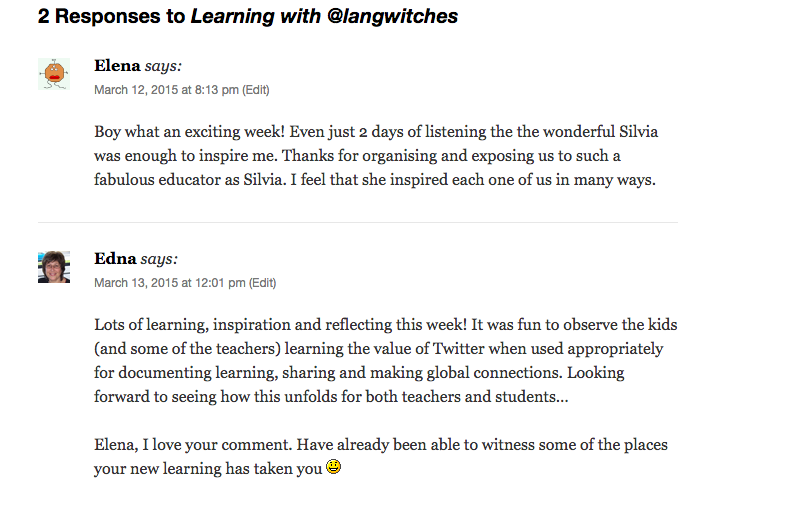 On her first day working with teachers, a full day, full on workshop which blows minds – some love it, others are overwhelmed – Silvia introduces several back channels at once. Participants are encouraged to use Today’s Meet and/or Twitter and volunteers take collaborative notes in a Google doc. Exposure to new tools and new ways of thinking. Connecting to our whole school goal of using data to inform learning (that of the teachers, as much as the students). 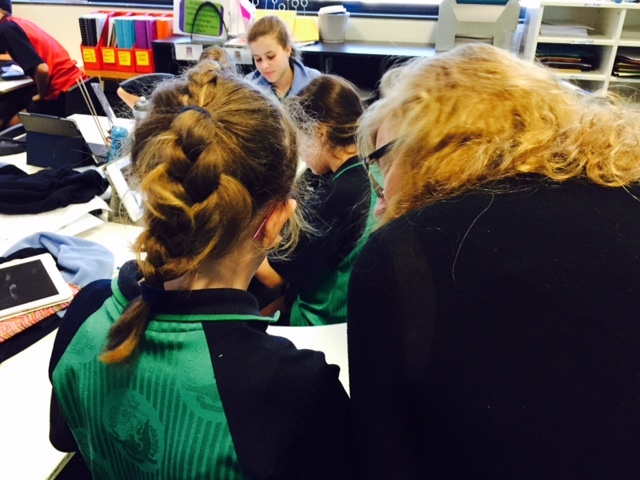 The rest of the week consists of intense learning in our upper primary school, with and from Silvia – in classrooms, in small groups and individually. 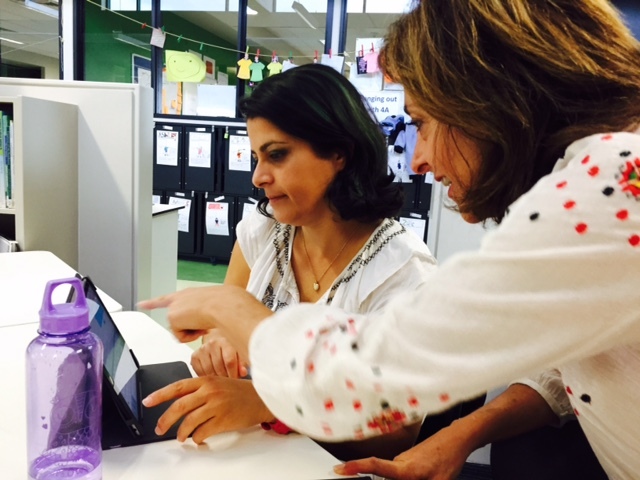 Teams meet with Silvia to talk, listen, choose and plan before she models in the classrooms. They meet again to debrief and yet again to reflect after they have experimented for themselves. Teachers are the documenters of and for learning. 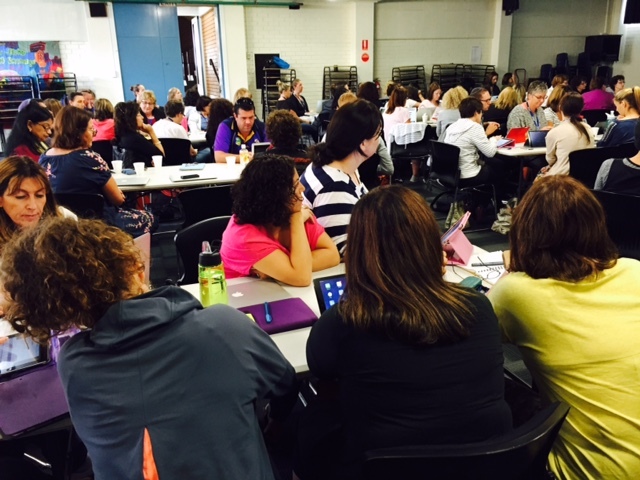 We’re watching, listening and gathering data to inform future learning… of the teachers, as much as of the students. Extended over an entire week, with time for experimentation and reflection. Tailored to our needs and goals. Big picture then zooming in to the details. Responsive, rather than pre planned and packaged. I curate stories of documentation via Storify. 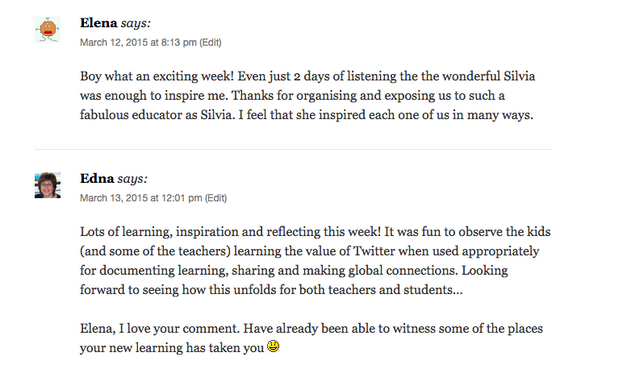 I encourage teachers to blog and I join the conversation via comments. 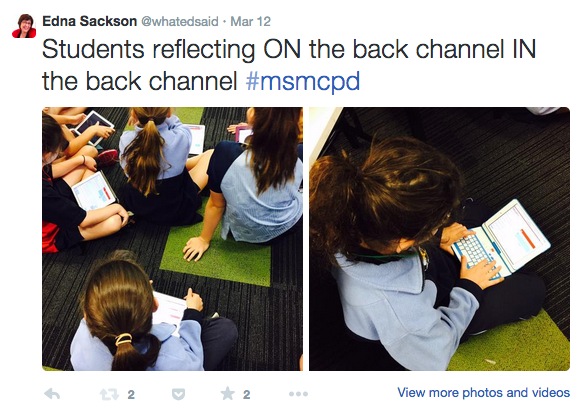 I agree with your post as far as the backchat in your mind – I usually take copious notes during presentations and then go back to blog on them, however I’ve tried at times to do the twitter backchat thing and find I can either listen properly or tweet, but not both. While I’m constructing my tweet and typing it out, I’ve missed minutes of the presentation, sometimes the exact minutes that can make a difference to my understanding. And it’s even worse if my tweet is responded to and then I’m off in a parallel world and thereby missing even more. I think that enough research has been done on the delusion of multi-tasking to say, yes, do all the back channel stuff, but perhaps leave it to afterwards? Perhaps it’s a skill one can develop with practice, as many do it successfully. Or perhaps it’s best seen as part of a collaborative exercise… Different people capture different elements in the back channel and the combined results are greater than what you could have achieved on your own. Or perhaps it’s not for everyone. Personally, taking copious notes is what distracts me from the content. Distilling the essence in tweets works better for me! One size does not fit all… nor should it. Not in life and not in the classroom.